This is a lovely caravan in Mablethorpe with a car parking space right next to the wheelchair accessible ramp. There is double glazing and central heating throughout as well as a gas fire in the lounge. There are two twin bedrooms and a double pull-out-bed in the lounge. 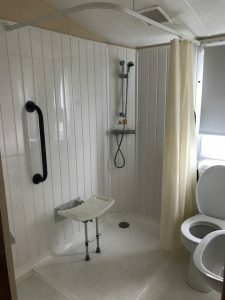 The caravan is adapted for wheelchair users And has a large wet room. This park is flat. The facilities include a large outdoor pool with a flume and a heated indoor pool. The Park has a funfair with plenty of rides and 2 course fishing lakes and there are miles and miles of golden sandy beach opposite the park. There are plenty of places to eat on the park including a quayside cafe bar, a fish and chip shop and a Papa John’s pizza. There is also a mini market, gift shop and hire shop.